Die Brücke, formed in Dresden in 1905 by four architecture students including Ernst Ludwig Kirchner, printed its manifesto in the form of a woodcut print. The medium’s potential for emphatic lines and primitive energy suited its pursuit of an emotionally expressive figurative art. Emil Nolde later joined. The group’s abstract counterpart was Der Blaue Reiter, headed up by Kandinsky, which emerged in Munich around 1911 and focused on ‘the spiritual in art’; Paul Klee and Lyonel Feininger were among its followers. In Berlin, Käthe Kollwitz had also been experimenting with etching and lithography since the 1890s. She was a socialist and pacifist and her sympathy for the suffering (fostered by her husband’s job as a doctor) inspired the powerful print series The Weavers (1893–97) and The Peasants War (1902–08). When Walter Gropius founded the Bauhaus in Weimar in 1919 he appointed Feininger to teach printmaking. Other fine artists were also hired: Klee, Kandinsky, Oskar Schlemmer, László Moholy-Nagy, El Lissitzky. All made prints. This flourishing period for Bauhaus prints ended when the school moved to Dessau in 1925. 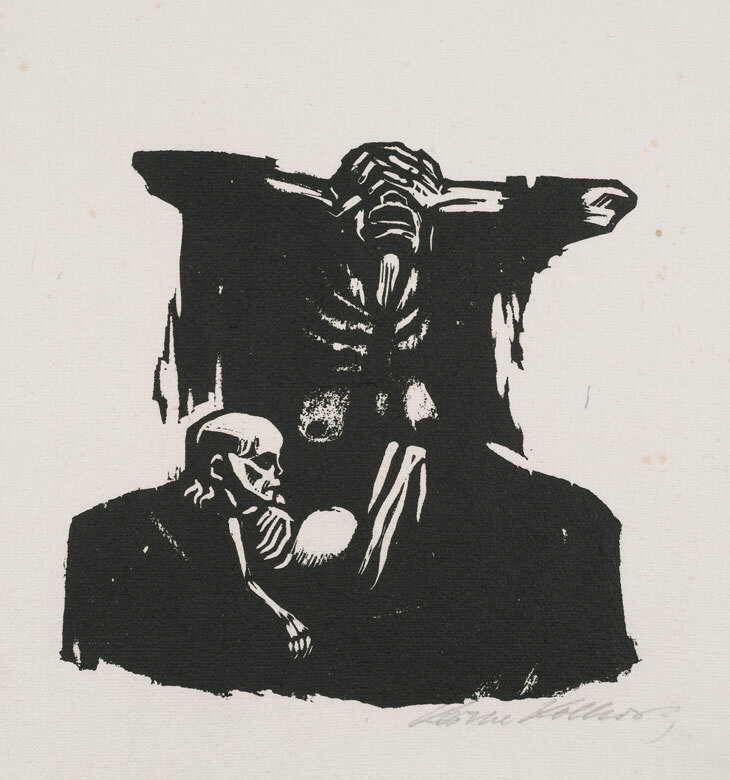 Kollwitz, who had lost her younger son early in the First World War, continued to draw and make prints during the turbulent Weimar Republic, producing the celebrated woodcut cycle, War, in 1921–22. This year marks the 150th anniversary of Kollwitz’s birth and sees a resurgence of interest in her output. Other artists emerging around this time in Germany included Otto Dix, George Grosz, and Max Beckmann; for all three, their prints are among their finest works. Sévérine Nackers, head of prints at Sotheby’s Europe, explains that the most sought-after Bauhaus prints are examples of the four completed portfolios from the ambitious Neue Europäische Graphik project (1922–24). Very rarely do complete sets come to auction. In 1996, Christie’s London sold one set of four, containing etchings, lithographs, woodcuts and linocuts, with contributions from numerous artists, for £199,500. Occasionally, she adds, single portfolios come up, usually in Germany and ‘rarely selling for over €100,000’. In 1922 Kandinsky published a virtuoso portfolio of 12 prints in 200 editions (with 30 special collector editions) – six lithographs, four drypoints and two woodcuts – titled Kleine Welten (Small Worlds), each image depicting an autonomous microcosm. The record price for a rare complete portfolio is $330,000, found at Sotheby’s New York in 1989. In 2011, one sold at Clars Auction Gallery in Oakland, California, for $110,000. In October 2016 three single prints from the series sold for just above their high estimates at between $17,500 and $23,750 at Sotheby’s New York. Kandinsky’s single print, Orange (1923), fetched a record £82,500 at Sotheby’s London in 1991, but more recent prices are closer to $50,000. In 2011 a rare edition of Kurt Schwitters’ 1923 Merz Mappe 3 portfolio of lithographs, one of only two print portfolios he made, fetched €97,600 at Grisebach auction house in Germany. Emanuel von Baeyer, who has prints in his London gallery by all these artists, confirms that there is still strong institutional and private interest in work by all the leading figures, with collectors looking for an outstanding or overworked impression or an inscription that makes the print unique. Alice Adam, the doyenne of print dealing in this field, based in Chicago, deals only in the exceptional and very rare. She comments that there is still a small discerning audience, although her core clientele of elderly Jewish émigrés is thinning. She recently sold a trial proof for Kandinsky’s Orange, which had never been exhibited – ‘the colour was so fresh!’ – for $150,000. ‘It was to a top-notch Swiss collector. He knew exactly what he was getting,’ she says. She currently has an important Kurt Schwitters – a trial proof for Merz Mappe 3 with additional collaged squares of colour where he is rethinking – which has been in a private collection since the 1950s ($160,000). London-based dealer Simon Theobald remarks that there have always been serious collectors in this field, rather than speculators, and that there is a particular enthusiasm for the charged prints of Kollwitz and Conrad Felixmüller among English collectors. He has Beckmann’s bowler-hatted self-portrait available for £110,000, as well as prints by Dix, Kollwitz, and Kandinsky. Weimar prints will also be available at the upcoming London Original Print Fair (4–7 May). Gilden’s Art Gallery will bring a strong presentation of German expressionist prints, including works by Die Brücke founding members Erich Heckel and Otto Müller, as well as Grosz and Beckmann (from £2,400). Stephen Gallagher, head of research at the gallery, reports a serious collector base in the UK and German-speaking territories, limited only by the rarity of this fragile material. I write to inform readers of Apollo, of the internationally acclaimed Early 20th century German Expressionist Art Collection at Leicester (New Walk Museum and Art Gallery). Acknowledged as the best representative collection of its kind in the UK, founded in 1944, the collection includes prints, paintings and works on paper by Franz Marc, Kandinsky, Beckmann, Otto Dix, Felixmuller, Grosz, Heckel, Kollwitz, Kubin, Kirchner, Munter, Nolde, Neuschul, Pechstein and Schmidt-Rottluff. Our website, with details of all works held is at http://www.germanexpressionismleicester.org . Simon Lake (Curator, Fine Art, Leicester Museums).